Beckwithshaw CC wrapped up a second consecutive Airedale & Wharfedale Division One title when they beat North Leeds in their final game of 2017. Alex Lilley’s side looked to be cruising to a fifth championship success, only for last month’s points deduction for onfield indiscipline to allow nearest rivals Otley back into the fight for pole position. The two sides were due to meet on the penultimate weekend of the season in what would have been a title-decider, but bad weather saw the fixture washed out. Thus, Beckwithshaw went into Saturday’s clash at North Leeds safe in the knowledge that if they bettered Otley’s result then they would clinch top spot. Sam Moore hit three fours and four sixes in a rapid knock of 46 and, with Mike Buller scoring 42, the men from Killinghall Road reached 227/9 batting first. Eugene Burzler and Oliver Hotchkiss then wrapped things up with three wickets apiece as the Leeds outfit were bowled out for 107. 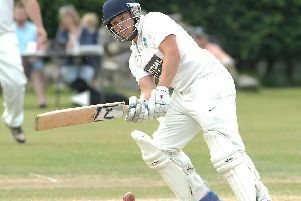 Bilton finished the campaign in sixth place, signing off with a four-wicket loss at Horsforth despite the efforts of South African all-rounder Kiel van Vollenhoven. The overseas ace hit a half-century in his team’s 176 all out and then snapped up 3-52 but the hosts managed to knock off the required runs in 43.4 overs. Aleady-relegated Collingham & Linton completed what has been a difficult season with an appropriately disappointing performance. A five-wicket haul from Toby Jacklin and a brace of dismissal apiece for Luke Kilby and Kuda Samunderu saw visiting Rawdon bundled out with just 117 to their name. However, what should have been a routine run-chase ended up going disastrously wrong and Steve James’ troops were skittled 18 runs short on 99, Samunderu their top-scorer with 24. Taking Collingham’s place in the top flight for 2018 will be Follifoot, who confirmed their promotion from Division Two as runners-up when they eased past Kirkstall Educational. Batting first, Paul Angove’s team posted 245 all out then dismissed Kirkstall for 119 to complete a 126-run success.